Egypt: Trendsetter for Democracy in the Mideast? Without international monitors, and a continued crack down on opposition parties and independent media, experts anticipate an over whelming National Democratic Party (NDP) win in this weekend's parliamentary election. No surprise there. The continued silencing of all dissenting voices in the lead up to the election is unmistakable. Yesterday two of the largest Egyptian opposition fan pages, "We are all Khaled Said" with 330,000 users, and "Mohamed ElBaradei" with 298,000 users, on Facebook were temporarily down ahead of Egypt's parliamentary election on Sunday. Facebook, working with activist, seems to have quickly resolved the issue. Yet in a recent Washington Post op-ed, "Egypt: Trendsetter in the Mideast", Egyptian Finance Minister Youssef Boutros-Ghali, a NDP parliamentarian, manages an extraordinary feat of balance and agility while arguing that the Egypt government has been unfairly criticized. In his article, Boutros-Ghali points to the country's economic growth as a sign of political freedom while simultaneously claiming that if there was political freedom there would be religious extremism and instability. He contorts the facts in a manner worthy of a world-class acrobat. Ghali is the leading architect of the Egyptian government's economic policies over the last decade and thus his views represent not just the NPD's economic platform in the upcoming election, but rather, its actual implementation over the upcoming years. First, Mr. Ghali claims that "what matters most to ordinary Egyptians is their standard of living; in this respect, the country is undergoing an astonishing transformation." The idea that economic reforms increase the standard of living is unfounded, as was reported in an NPR's Morning Edition last week. Children play near their home in the Duweika area of Cairo. 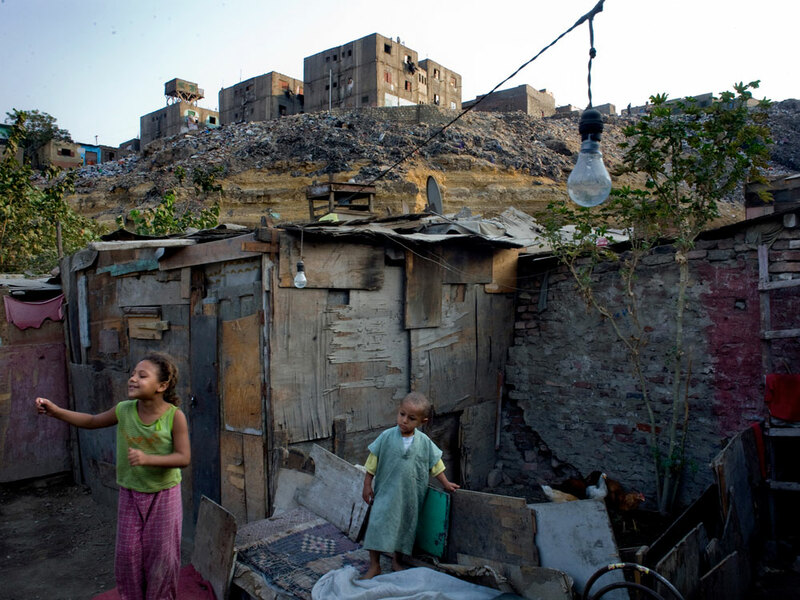 A growing majority of Egypt's population is scraping by on less than $100 a month and can only afford to live in shantytowns and tents. Mr. Ghali's claims are based on macro-economic reforms that won't impact the standards of living of most Egyptians unless combined with serious political reform-- an issue Ghali sidesteps. The same day the article was published, the Human Development Report, issued by the United Nations Development Program, ranking Egypt # 101 out of 169 countries. The report, which tracks health, education, poverty and income inequality, continued to criticize Egypt for its "complete lack of political accountability." Economic reforms without political reforms will only serve to exacerbate, not curb, corruption. Government affiliate businessmen benefit from a monopoly over huge government contracts. In fact, Ghali himself used government money allocated for the needy to receive world-class medical treatment in the US. Egypt is racked 115th out of 179 countries in Transparency International's Corruption Perceptions Index. The gap between poor and rich has continued to increase. The World Bank reports that 42.5% of population makes less than $2 a day, while Nassef Sawiris's net worth went from $3.9 billion to $11 billion in 2008. For most Egyptians any economic growth is neutralized by spiraling inflation. At 11.8%, just .2 % lower than Iceland in the middle of its economic meltdown, it has more then doubled in the past 5 years. Second, Mr. Ghali points the bogyman under the Egyptian political bed - "fundamentalist mullahs, fomenting instability and allied with rogue regimes", i.e the Muslim Brotherhood -- to force international criticism turn a blind eye to continued human rights abuses. The brotherhood and a rising Islamic inclinations has repeated been presented as a clear and present revolutionary threat to the secular government and foreign interests in the region. Mubarak, and Sadat before him, used the threat of a rising Islamist movement as a way of justifying human rights violations and the continued suffocation of civil society, which only serves to further endear the people to the brotherhood. Until recently the only politicized voice within Egypt had been the Brotherhood with its religious overtones. A secular player in the political stage would likely siphon support from the Islamist movement, the Muslim Brotherhood. It would also engage previously non-politicized moderates who were previously deterred by the religious undercurrent in Egyptian politics further strengthen the voice of the moderates. Yet at the first sign of a secular movement the Egyptian government suppresses it. Five Years ago, Ayman Nour was a secular alternative that was not a threat to US interest. Yet he was imprisoned, on trumped up charges, shortly after his failed presidential bid. Today, El Baradie is solidifying a populist base around a tolerant and secular platform, only to find the government has attempted to silence the reform moment by cut off access to the government controlled media and all alternative outlets censured or shut down. The Egyptian government has made its bed and now must lay in it. The real culprit fomenting discontent is the continued economic disparity, police brutality and an administration that limits political participation to its own party, and not DC Wonks or the bogeyman under the bed. If indeed "[t]here must be room for vibrant secular alternatives," We need an open and free election and a free press that can hold both opposition candidates and the NDP accountable. As Ghali said "[t]he choice should not just be between the National Democratic Party and the fundamentalists." Greater opportunities for instability will derive from the growing economic disparity and not religious inclinations. Egypt economic growth is happening in spite of government mismanagement not because of its new economic reforms. With natural resources, Oil, Gas, increasing Suez Canal returns, and billions of dollars of money transfers from Egyptians abroad, the country should have achieve much more, if it wasn't for the government corruption and mismanagement. Egypt must move into a new era of reformed governance and justice.